A new development where the Fashion District and Entertainment district meet is perfect for those who crave the day and nightlife of Toronto. 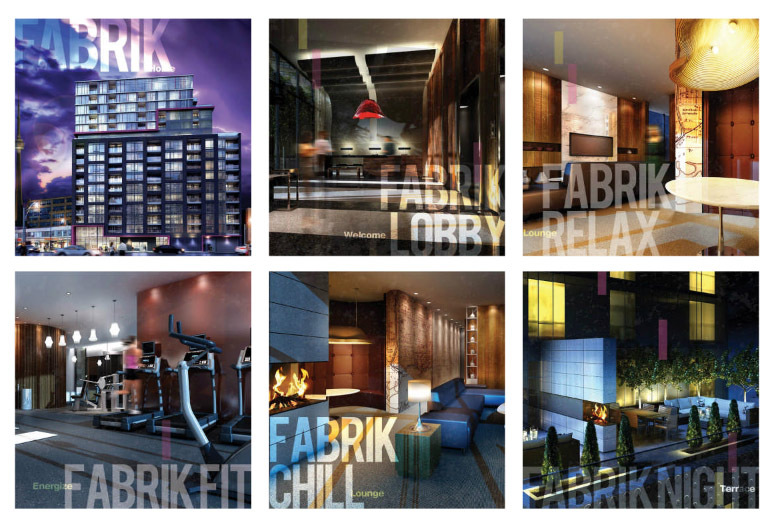 Menkes’ new project, Fabrik Condos is under pre-construction at 431 Richmond Street W. and is scheduled for completion in July 2015. Fabrik’s modern and unique exterior will rise 16-storeys high that will certainly stand out in this area. There will be approximately 168 units with a wide range of floor plans to choose from varying from 424 to 1,388 square feet starting in the mid $200’s. Each unit will have high 9-foot ceilings, laminate flooring, quartz kitchen counter tops and Energy Star appliances. Amenities will include a stylish lobby with an 8-hour concierge service, guest suites, well-equipped workout facilities including a yoga studio, party room, screening room, pet grooming room. The highlight of this condo is a beautifully landscaped terrace found on the 11th floor overlooking the city. It will feature a fireplace, multiple barbecue stations and a lounge area to socialize. With its ideal location with future developments in the area, Fabrik units will sell very quickly without a doubt! Fabrik Condos, 431 Richmond St. W.
Categories: Downtown Toronto Condos, Toronto Condos | Tags: 17 Church avenue, 431 Richmond Street W, Downtown Toronto Condos, Entertainment District, Fabrik Condo, Fabrik Condos for Sale, Fabrik Condos Sales Centre, Fashion District, Keller Williams north York, keller williams real estate service, kirby chan, Menkes Deveopment, Richmond & Spadina, Toronto Condos, Toronto Real Estate | Permalink. A new urban development in the West Don Lands will be introduced as the Canary District. It is located at Front and Cherry Streets in downtown Toronto. The Canary District Condominiums is a single project (composed of four buildings) that will occupy a block out of the eight being developed in the district. It is said that it will evolve into Toronto’s largest urban village as it will be modern and a pedestrian-friendly community. The building’s exterior consists of stone, metal and glass while its interior is furnished with hardwood and engineered floors throughout (utilizing locally-sourced materials); kitchens feature ceramic porcelain backsplashes, built-in and concealed kitchen appliances and European-style kitchen range hoods; spa inspired bathrooms where a choice of marble or porcelain full height wall tiles in tub/shower enclosure and a custom designed vanity with quartz vanity top.Canary District Condominiums will have 369 residential units of townhouses and lofts pricing at the low $200’s consisting of a privately raised courtyard, accessible from the second to the mezzanine. Just because you live in a condo doesn’t mean you have to go to the park or gather at someone else’s home. An outdoor barbeque and dining area is conveniently located within the building! Other amenities include a billiards room, party room and 24 hour concierge while an 18-acre Don River Park, upcoming YMCA, George Brown residences, upscale retail, dining, sports, art and culture are minutes away! Lay down some roots and be a part of this new community as the Toronto Waterfront may be the new place to be. A celebration of life and nature, family and community. It is estimated to be completed by 2015. Buying, Selling or Investing in Real Estate? Ask Kirby Chan any questions that you may have. Fill in the form below or text your question to 416-305-8008. Categories: Downtown Toronto Condos, Real Estate Articles, Toronto Condos | Tags: 17 Church avenue, 9 Mill Street Sales Office, Canary District, Canary District Condos Pricing, Don River Park, Downtown Toronto Condos for Sale, Dundee Kilmer Development, Front and Cherry Condos, George Brown College residences, Keller Williams north York, keller williams real estate service, kirby chan, kirby chan real estate, Pan Am Games Residence, Toronto Condos, Toronto Real Estate, Toronto Waterfront, Toronto Waterfront Community, Waterfront Toronto, West Don Lands | Permalink. B. Streets Condos is a new condo and townhouse project by Lindvest Properties located at Bloor and Bathurst Streets in Toronto’s Annex neighbourhood. A beautiful “cube”-like exterior occupies 4-storeys diverting its elongated appearance while providing contemporary design. B. Streets Condos embodies a 9-storey residential complex on top of the retail level. The main floor provides a generous walk-way and retail stores that can be of convenience to pedestrians and residents. Other amenities include a concierge, internet lounge, party room, theatre room, outdoor patio with bar when you feel like having friends over; a fitness centre, yoga studio and hobby room to relieve some stress. The Bloor Cinema and many of the city’s best amenities can also be found around the area! General suite finishes include stainless steel and energy efficient appliances, composite quartz counter tops with a choice of subway style backsplash, wide plank flooring, 9-foot ceilings and balconies. Clients will have 195 suites to choose from, professionally designed by Cecconi Simone Inc., in which every single unit has a unique design from the last. Suite types include a Studio, 1, 2 or 3 Bedroom, 1 or 2 Bedroom + Den, 2-storey Penthouse Lofts and Townhouses. The current price for available units start from the mid 200,000’s to the mid 900,000’s ranging from 1,043 to 1,264 sq feet. B. Streets Condos occupancy date is scheduled for April 2014. With Lindvest Properties’ B. Streets Condos winning the highest number of awards for a project at the 32nd BILD Awards, this condominium will sure attract new residents while residents who currently live in the area already know what they’re NOT missing! Categories: Downtown Toronto Condos, Toronto Condos | Tags: 17 Church avenue, B. Street Condos, BILD Awards, Bloor and Bathurst, Downtown Toronto Condos, Downtown Toronto Condos for Sale, keller williams real estate service, kirby chan, kirby chan real estate agent, Lindvest Properties, pre-construction condos, The Annex, Toronto Condos | Permalink. 204 Munro Street, Toronto M4M 2C2 – A Toronto Investment Opportunity! This South Riverdale end unit townhome can be found on a quiet, tree-lined street at Broadview and Gerrard. It is only minutes away from downtown Toronto, Don Valley Parkway, shopping, TTC and restaurants. 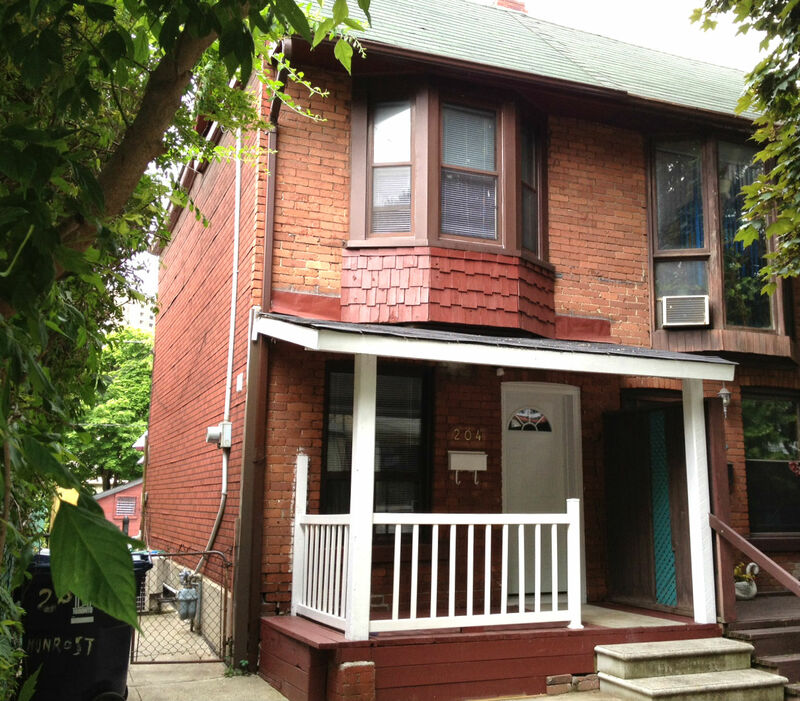 204 Munro has been divided in to 3 potential units and is a great investment. It is also a great potential to be converted in to a single family home. The first unit includes an open concept kitchen that is updated with ceramic flooring and a gas stove. There are two rooms with laminate flooring plus a 2-piece bathroom upstairs. The master has beautiful bay windows providing natural sunlight. The second unit can be found at the rear of the home with a bedroom, galley kitchen, living room and a 3-piece bathroom in the basement. Laminate and ceramic flooring can be found throughout the second unit. The updated kitchen provides just the right amount of space. The third unit is a studio unit located in the basement. Its open concept style living features an updated kitchen and a 4-piece bathroom. 204 Munro has shops and restaurants that are within walking distance, while the Don Valley Parkway (DVP), street cars and bike lanes are easily accessible. Shops, restaurants, library, schools, 3 large recreational parks and other great amenities can be found close by. Categories: Deal of the week, Listings | Tags: 17 Church avenue, 204 Munro, 204 munro St, 204 munro street, Broadview and Gerrard, broadview and gerrard homes for sale, Downtown Toronto, first time home buyers, homes for sale near chinatown, income property for sale in toronto, investment properties broadview, keller williams real estate service, kirby chan, north riverdale real estate, Old China Town, Renovations, Riverdale Homes, south riverdale homes for sale, toronto, triplex in riverdale for sale | Permalink. Nootka Crescent is located in a quiet L’Amoreaux neighbourhood. Nootka Crescent is conveniently located close to Highway 404 and Highway 401, easy access to public transit, schools, supermarkets, a shopping mall, restaurants and parks, to name a few. Please contact me to book an appointment to see homes for sale on Nootka Crescent and in the surrounding area. Categories: Deal of the week, Listings | Tags: 14 nootka cres, 14 Nootka Crescent, 17 Church avenue, finch and victoria park homes for sale, homes for sale finch/404, homes with basement apartments for sale, Keller Williams north York, Keller Williams realty, kirby chan, L'Amoreuax Homes, linked homes for sale, micmac crescent, Nootka Cres, Nootka Crescent, Nootka Crescent Toronto, pleasantview homes for sale, semi-detached homes for sale, shawnee crescent, Victoria Park and Finch Ave | Permalink. 15 Coyle Street, Ajax L1T0A3 – MLS E2371001. 6-year old Detached 2-Storey Home at 15 Coyle Street, Ajax built by Great Gulf Homes. It has 4 bedrooms and 2½ bathrooms, located near Salem Road and Taunton Road. It is one of the best homes on Coyle Street because of the finishes and great layout. Conveniently located to all amenities. Close to the Highway 401, Parks, Church, Schools, Shopping and Go Train Station. Lots of upgrades like 9-foot ceilings on the main floor, hardwood floors, stainless steel appliances, gas stove, open concept kitchen with pantry and upgraded/extended cabinetry, mirror back splash, central air conditioning, garage door opener, direct garage access and ensuite bathroom in Master Bedroom. If you are looking for a 2-car garage home in Ajax, than you can not miss this chance! We have an open house this weekend May 26th and 27th @ 2-4pm. Please contact me to book an appointment at all other times. Categories: Deal of the week, Listings | Tags: 15 coyle Street, 17 Church avenue, 2-car garage homes for sale, 4-bedroom detached homes for sale, ajax homes for sale, coyle st., coyle street ajax for sale, e2371001, Great Gulf Homes, Keller Williams north York, keller williams real estate service, kirby chan, mls #e2371001, north-east ajax, taunton and salem houses for sale, unfinished basement | Permalink. Categories: Deal of the week, Listings | Tags: 17 Church avenue, 4 bedroom detached home, 55 darren hill trail, darren hill trail, greensborough detached 2-storey for sale, greensborough home for sale, homes near mount joy go train station, Keller Williams north York, keller williams real estate service, kirby chan, L6E0H4, markham home for sale, N2351947, unfinished basement | Permalink.